Oh Canada! There are many homegrown talents that are making international headlines, from musicians, actors to designers and even beauty brands. Did you know MAC Cosmetics was founded in Canada? It is now one of the top three global makeup brands. There are so many Canadian beauty brands out there and you best bet that I'm proud of each and every one of those companies, whether they're locals or have made it international. 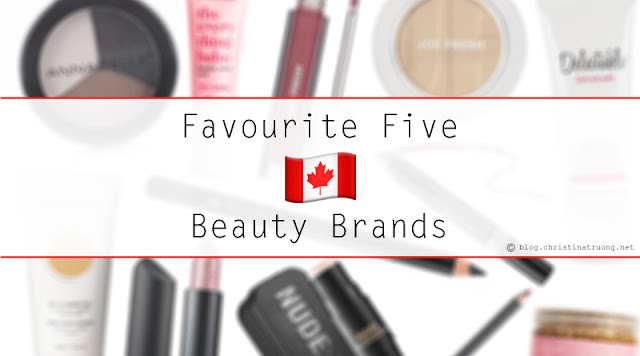 I have a long list of favourite Canadian beauty brands, but I thought I should just list five that I admire. As well, give a shout out of a product from each that I consider a holy grail. An award winning lip gloss that comes in five unique and vibrant flavors, vegan and cruelty-free, Flickable is made with the highest quality standards, delivers one-of-a-kind results and has finally arrived in Canada, sold exclusively at Hudson's Bay! Maybelline's Brow Precise Perfecting Highlighter shapes and accentuates brows for a polished total brow look. The creamy highlighter and angled tip applicator delivers shaped and highlighted brows in a few strokes. Want the perfect foundation fit? It's all about matching skin tone and texture. Ideal for normal to oily skin, Maybelline Fit Me Matte + Poreless Foundation's exclusive formula with micro-powders controls shine and blurs pores. It also mattifies and leaves a natural, seamless finish. If I told you that I still iron my clothes using my Mom's 80's clothes iron that has no advance tech to it and trust that it won't burn my clothes, would you laugh? Probably. That's why I avoid buying clothes that can be easily wrinkled. And the clothes in my closet that are wrinkled? Those rarely get worn or I would use a hair straightener to avoid taking out the iron and pulling out the ironing board. That all changed thanks to Conair Turbo ExtremeSteam with Dual Heat Technology Handheld Fabric Steamer. This user friendly stand-up design, built-in creaser, and aluminium plate steamer made me say goodbye to the ol' iron! It's quick and easy to use with just 2 settings (standard and turbo) and heats up in 40 seconds. It also saves times and money, works on most types of garments and fabrics, and no chemicals are needed as you just add water.